The JBL CSMA 2120 is an 8 channel, 120 Watt powered mixer-amplifier. This mixer amp offers ease of use, with a clean, front panel featuring volume controls and master volume adjustment, adjustable bass and a power switch. All volume controls on the CSMA 2120 are surrounded by an illuminated ring, making them easy to see and operate in darkened environments. The amplifier can drive 8 ohm and 4 ohm loads and can be used with 70V and 100V distributed audio systems without the need for a separate transformer. 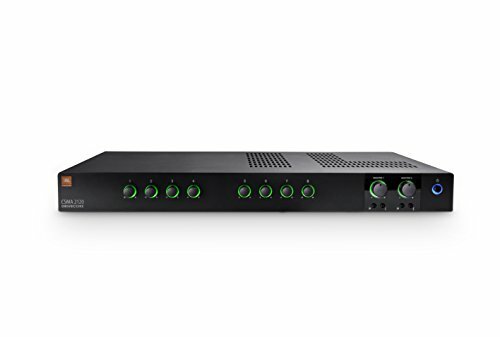 In addition to balanced mic/line inputs, unbalanced RCA inputs and speaker connections, all units include RJ45 connectors for use with JBL CSR-V in-wall volume controls. This model feature a universal power supply which enables the ability to accept AC voltages from 100 to 240 VAC, 50/60Hz. - More operating efficiency and reliability by using fewer parts. - Significantly reduced power consumption. - Iluminated rings make them easy to see and operate. - Iluminated rings make them easy to see and operate. - A proprietary hybrid analog-digital integrated circuit. - A proprietary hybrid analog-digital integrated circuit. - Priority muting. - Phantom power. - Phantom power. - Universal power supply. - Fanless, space-saving 1U design. - Euro-block type mic/line input connectors and output connectors.